Most people listen to podcasts on mobile devices (64%), so let’s start there. 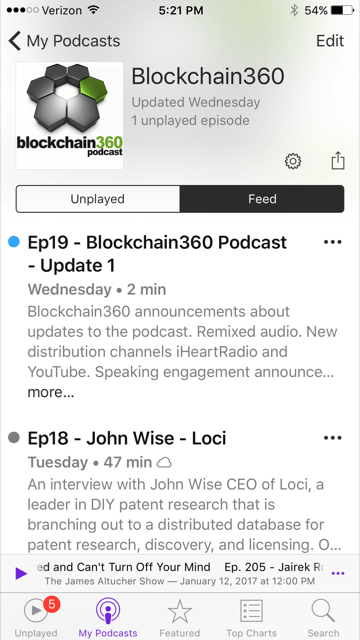 (2) I’ll be using my podcast, Blockchain360, in the following screenshots. 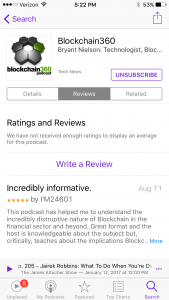 Let’s say you’re listening to a podcast you’ve subscribed to (the user flow is roughly the same for episodes you’ve downloaded, but have not subscribed to), and the host asks you to leave a rating and review on iTunes, and you decide to go for it. 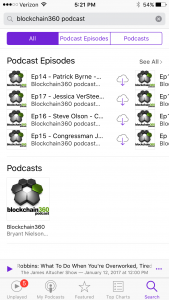 You click on the podcast you want to review in “My Podcasts”. That seems a reasonable place to look, right? 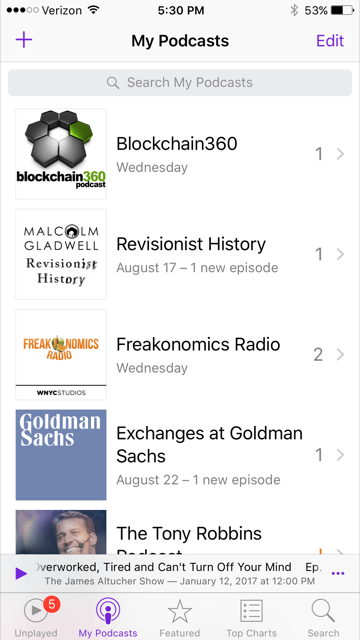 A podcast in “My Podcasts”. But, nothing jumps out at you, so you start clicking everything to see where to leave your review. How about that share icon? That would make sense…nope — that’s only for sharing via email/Twitter/etc. How about the settings icon? Damn, no — this is only for subscriptions settings, like downloading, ordering, and notifications. Maybe the “Edit” link up top? Still no luck — that’s for marking or saving episodes (no idea what those are, btw). I’m not sure how many people give up here, but I would guess it’s quite a few. There’s nothing intuitive about searching for the podcast after you’ve already done so prior to subscribing. 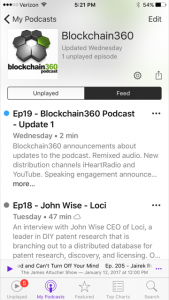 Finding the podcast (again) in “Search”. 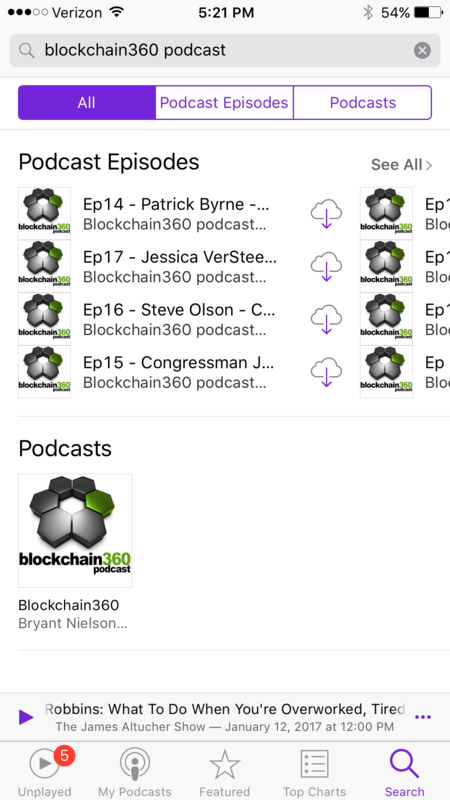 You can click on either an individual episode or the podcast itself in the search results because they lead to the same place. 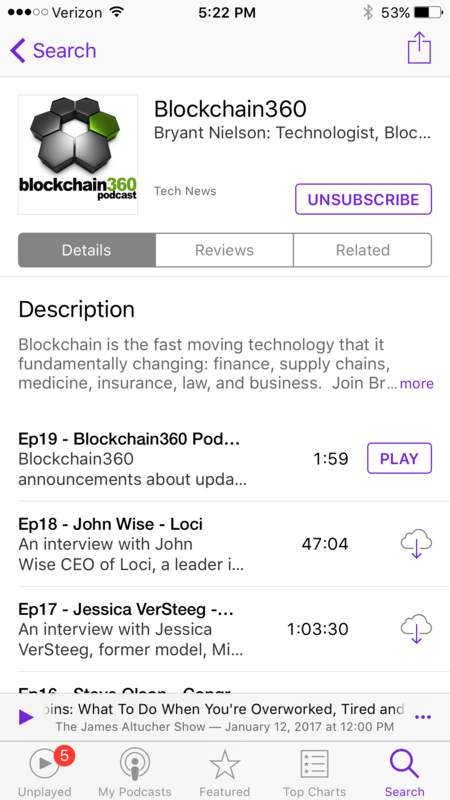 It’s a screen that looks a lot like the one we saw before in “My Podcasts”, but this time it’s in iTunes. You wouldn’t guess that though because there are no labels or anything in the UI that hints at that. 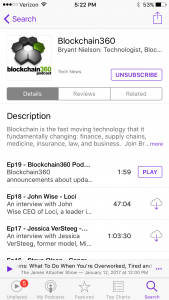 A podcast in “Search” (aka iTunes). 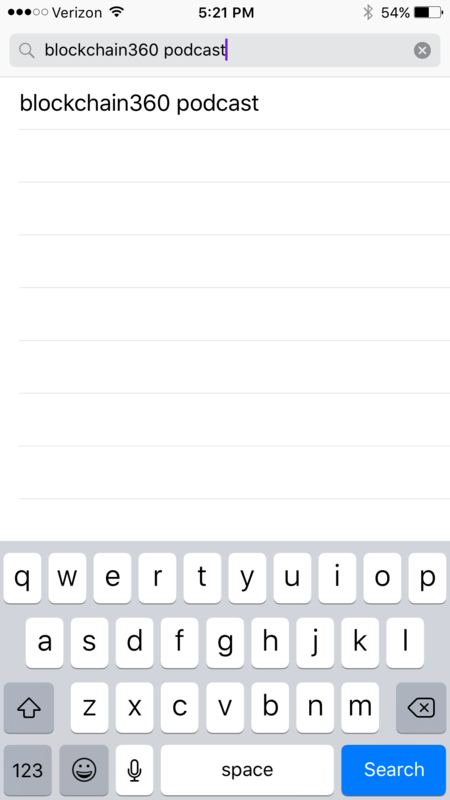 But, look… There’s a tab labeled “Reviews”! You click it. And there’s a “Write a Review” link! Hooray! You click it feeling victorious. 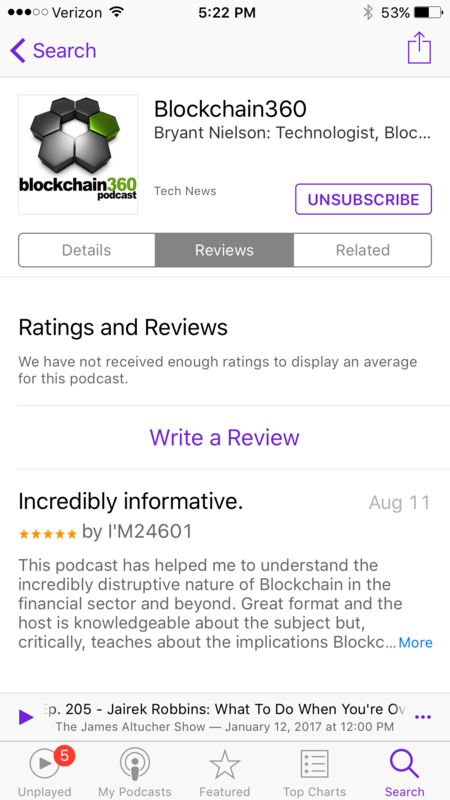 Log into iTunes to leave a review. Argh! 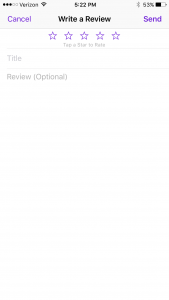 You need to log into the iTunes Store to leave a review. And that’s when you remember Apple just forced you to change your Apple ID password to something complex that you can’t remember. 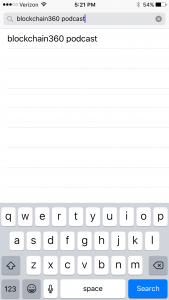 So, you open up your password manager app (you have one of those, right?) and fetch your gnarly password and paste it in. It works! 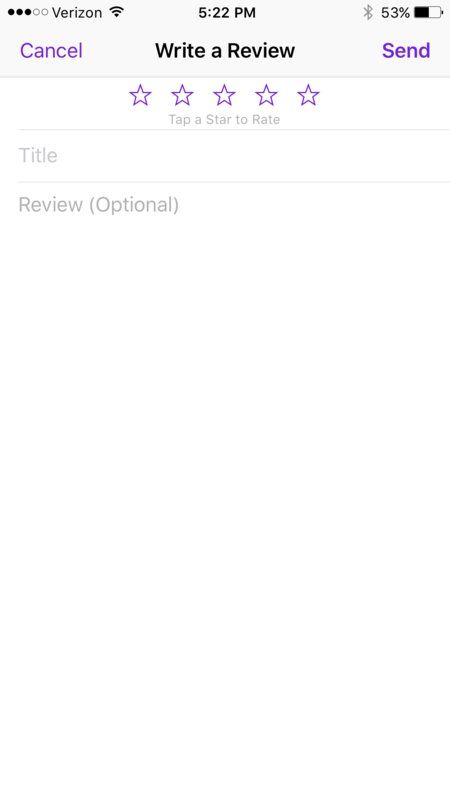 “Write a Review” — Post-login broken on left, reloaded working on right. Well, it should, but there’s a bug and the review screen is mysteriously blank, so you hit “Cancel” and click “Write a Review” again, and, finally, you’re ready to leave that rating and review. After a user experience like that, it’s hard to believe anyone remains motivated enough to follow through on leaving a review. If you’ve actually done this for a podcast you enjoy, you are an angel and you should be rewarded with cookies and hugs.